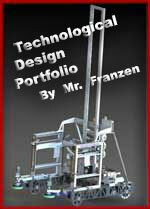 Welcome to Mr. Franzen's Education Web Site! 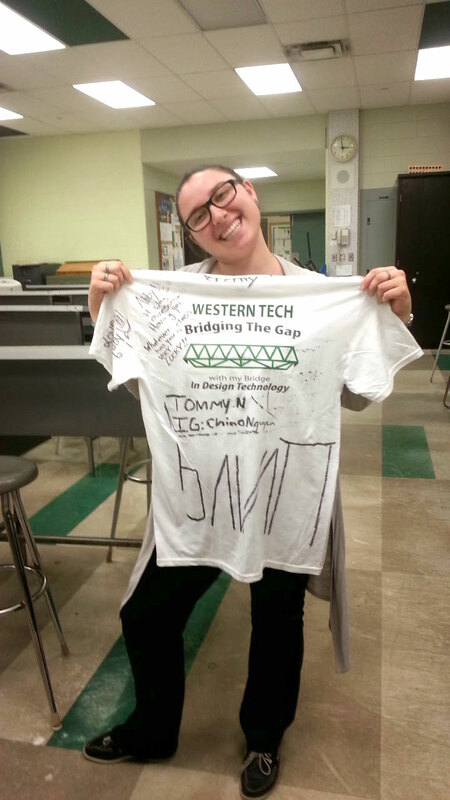 I am a Technical Educator teaching at Western Tech for over twenty years, and created this site for students, parents, teachers, support staff, and administrators, to help with the education process. 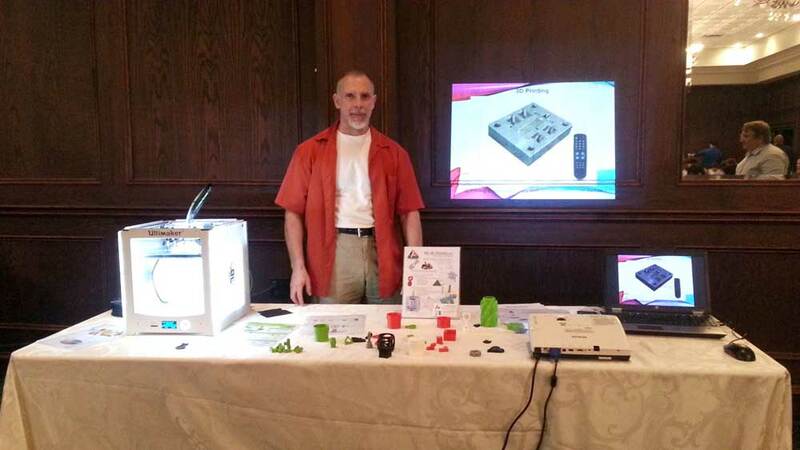 You can find out more about me in the "Support" menu section and a recent Tech Design portfolio. 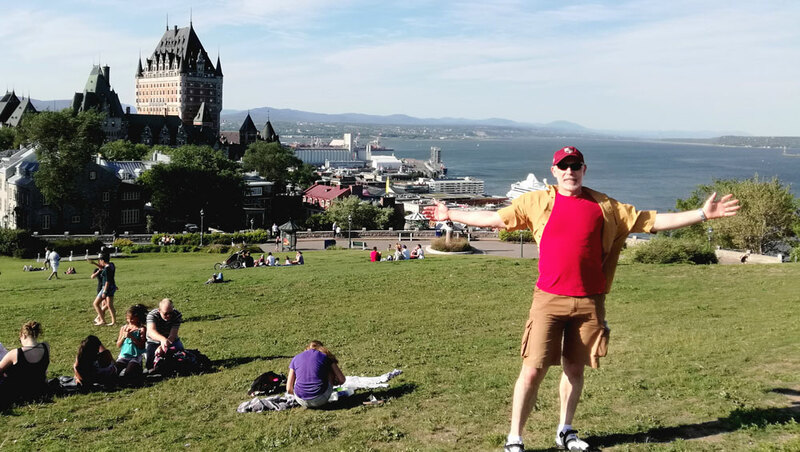 This is a third generation web site that has been rebuilt from scratch and is constantly updated as time permits and as resources are needed. 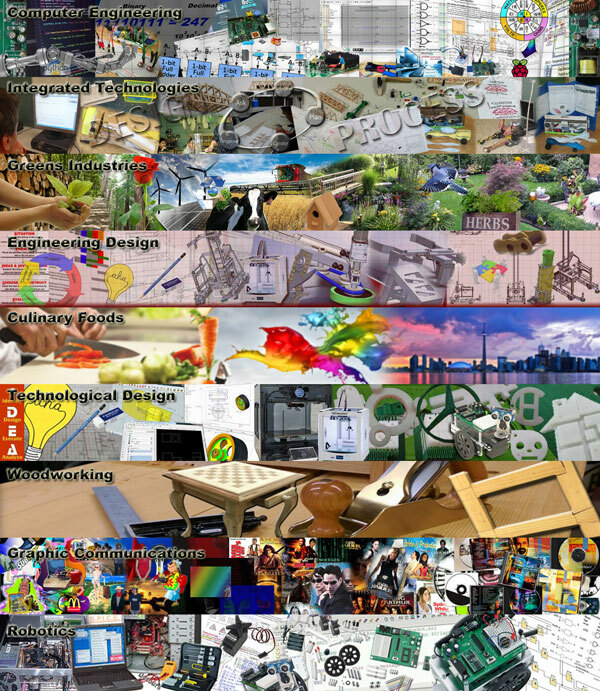 Each course shows details of work covered broken down into units and activities as shown in the course outline. All handouts can be downloaded and printed, instructions are provided, projects and assignments have additional support information, and resources to supplement work to be completed. A daily journal for courses shows a quick recap on class topics, work done, handouts, etc. which can be compared with unit activities and marks. All marks can be viewed (by student number) to see current standings, if there are any zero's, then that work is past due and will affect current student mark. When you see the blue up arrow - usually with the key topics from the page content links, you can click on it to get back up to top of the page, and then again using the finger-point symbol with topic content links to the right, get to where you want quick, as most pages on this site can be a long scroll to find your particular topic. For current courses, just click on the quick course details link under the Quick Info, top of blue column above. For more info, use the horizontal menu just below the header, usually Courses >Specific Course >Grade level, then you can select either the Outline, Details, Journal, and/or Marks. Note, each course has it's own background colour scheme, so as to not accidently go into the wrong course. When you see the finger-point symbol near the top of any of the pages on this site, you will know there are page topic content links to the right for the rest of the page below, allowing you one click access, thereby reducing scrolling to find specific topics. Most pages on this site are long and using the finger-point symbol - content page links, will allow you fast access to that topic. Use the links in-line finger page links to go directly to our school related news topics or just scroll down to see all. Recently this site was spot-lighted by Onlline-Geeks.com --and earlier on EEWeb as Engineering Site of the Day for what these sites have to offer. Both of these sites has related technical sites reviewed and further support resources you may find useful to check out. Note, your password will expire after 180 days. After about a decade of this class taught as a rotation between course areas/locations with specific teachers, the course is now back to a full credit course with the same teacher throughout the semester in refreshed two room facilities. Both the lab/theory and shop have been extensively upgraded and refreshed. 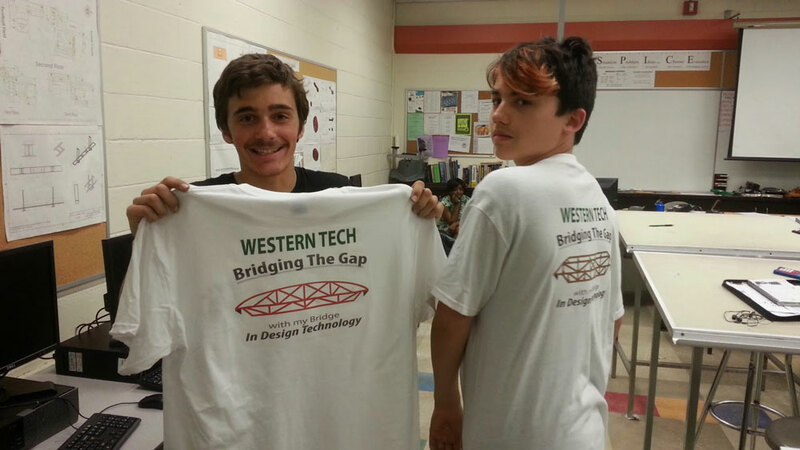 Students have a great opportunity to experience a wide variety of related technologies through hands-on technical related projects to learn and build their understanding, better prepare, and organize themselves for taking future tech related courses here at Western and help with possible career directions. 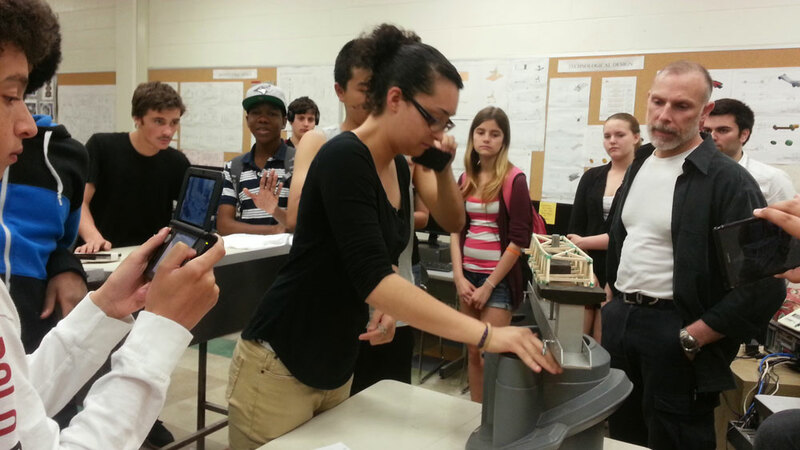 Check out the Exploring Technologies course gallery pictures to see projects in action. Construction Trade as a Career? - Students give it a Try! Two construction classes worked on multiple projects including some clean demolition, rough-in framing, electrical, and plumbing throughout semester. They worked on wire preparation through wire joints and connecting common electrical devices, concrete forms, pouring concrete with re-bar and wall anchors, rough-in framing with 2*6 and 2*4 spruce, plumbing drain and PEX water supplies, and rough-in electrical. The L-Partial Wall project was designed to give a variety of experiences such as exterior wall and interior wall components. Exterior, interior, and flooring was also a plan, but students were not able to get that far, maybe next time. 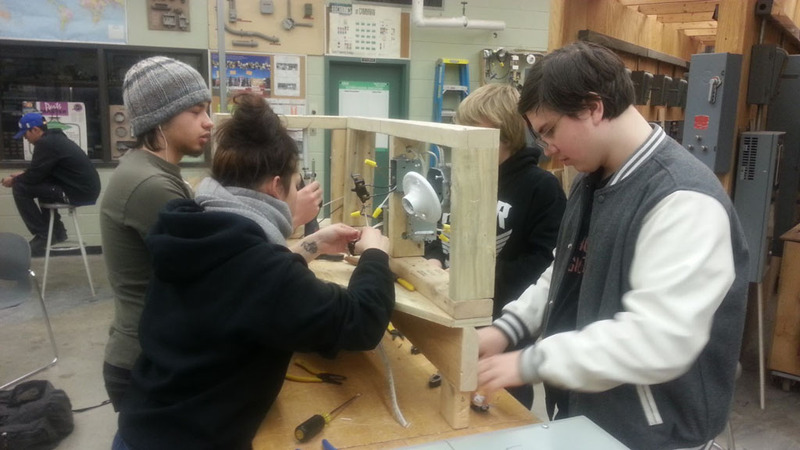 Students learned a lot and some have made decisions on going into specific areas, such as Rob who is going immediately into an electrical apprenticeship, and Megan (in picture below) which is getting into a construction framing program leading into rough-in carpentry. This course is a great way to experience some of the construction related trades and be able to make the informed and experienced decision for a construction career. 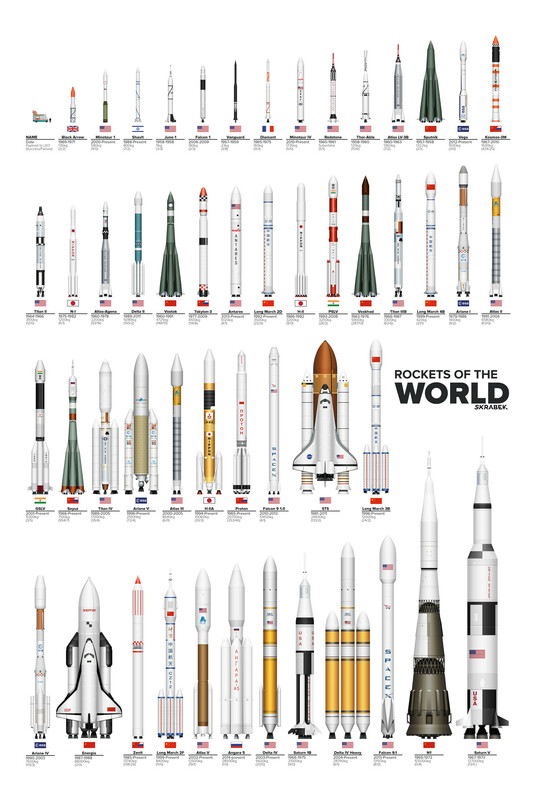 See Gallery for 40 related pictures. 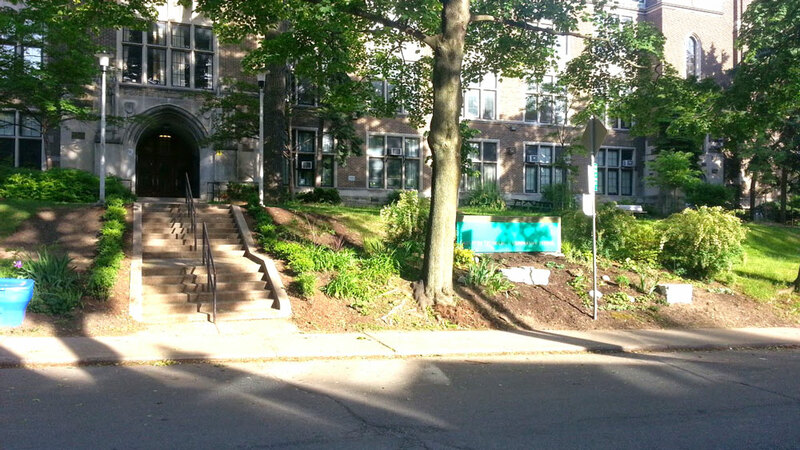 Two Green Industry courses worked on the front of the school adding soil to level the ground on either side of the main entrance stairs, planted a blue mountain boxwood hedge along both sides of the stairs, added two 1700 pound arbor stones in the front of the Western school sign along with some plants, more top soil, and some transplants of day lilies. Mrs. Brett offered some plants to also plant around the area along with some grass variations to fill in around the sign and fill in the rock garden. Adding cedar mulch around the hedge and adding grass seed on either side of the hedges will finish it off. More planting is planned in the fall. Thanks to Administration, Officer Troy, and Mrs. Brett for their contributions with the course teachers and students. Students enjoyed a delicious pizza lunch thanks to Officer Troy. See Gallery for more pictures. 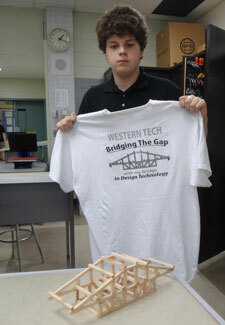 One of the projects, students taking Exploring Technologies did, was design a bridge first by sketching, then drawing it on Illustrator to scale, then printing the bridge to a one-to-one scale on paper, and finally using that design plan to cut and glue 5 mm by 5 mm bass wood to make their bridge. 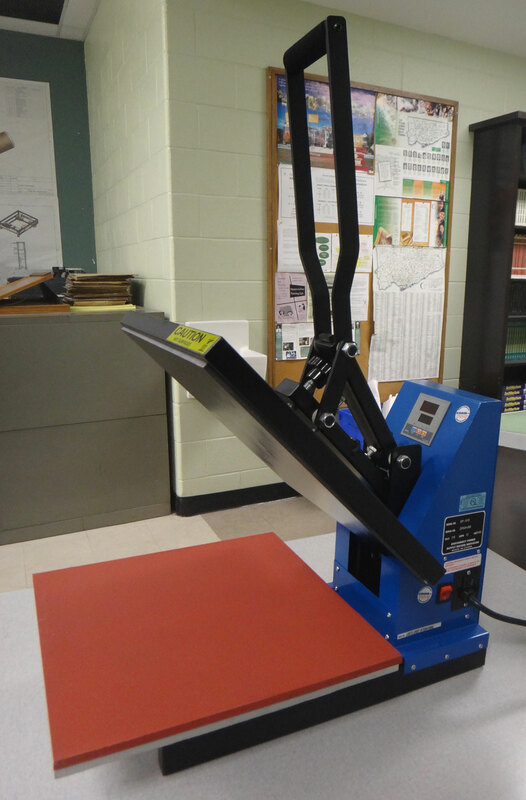 Destructive testing proved efficiency goals of over 1000 for some students. 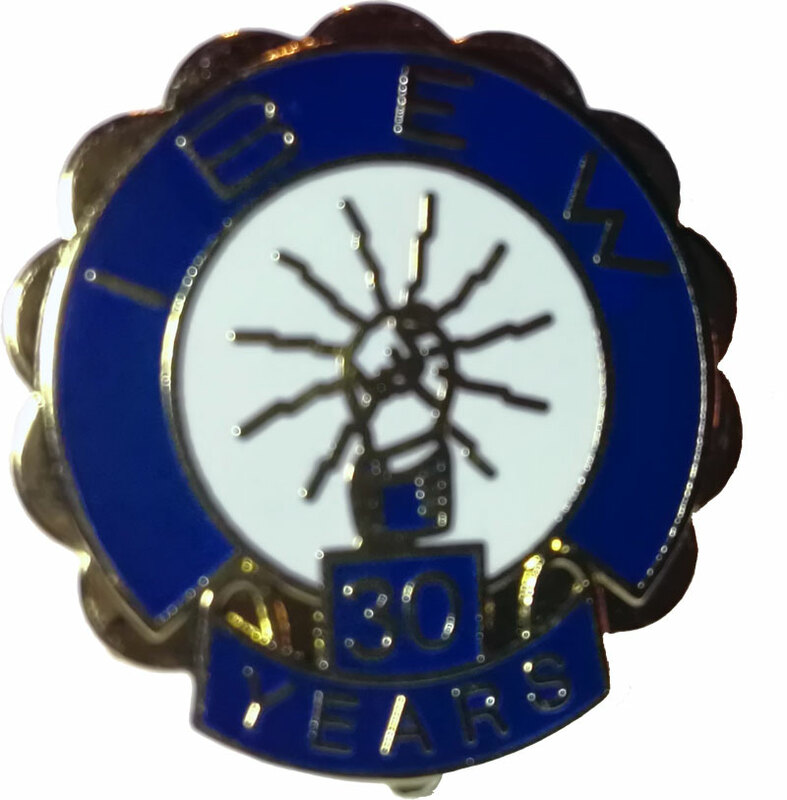 Once built and tested, an evaluation was completed and their illustrated design was transferred on to a Western T-shirt as a souvenir to take home with them. Check out the Gallery for more pictures. Mrs. Lanni was here from York University as part of her final practicum. She worked with all classes and contributed a lot with students in each of Mr. Franzen's classes this month and student will miss her. Students were very appreciative of all her teaching, student help, and support. 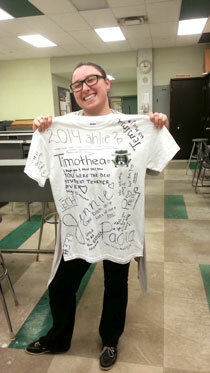 Foods, Tourism.Com had a great finish with T-shirt collages of students' work. Lots of great potential talent here at Western, where students may continue on, to related courses in the communications technology courses offered here at Western. The T-shirts collage designs were based on several projects worked on in class such as the tourist, web design, logo, and the movie poster and then creatively combining into a collage and then transferred onto a free Western Tech logo stamped T-shirt using our clam heat press. We had a successful grade 9 parent presentation. Parents dropped by to see some of the classes and meet the teachers. 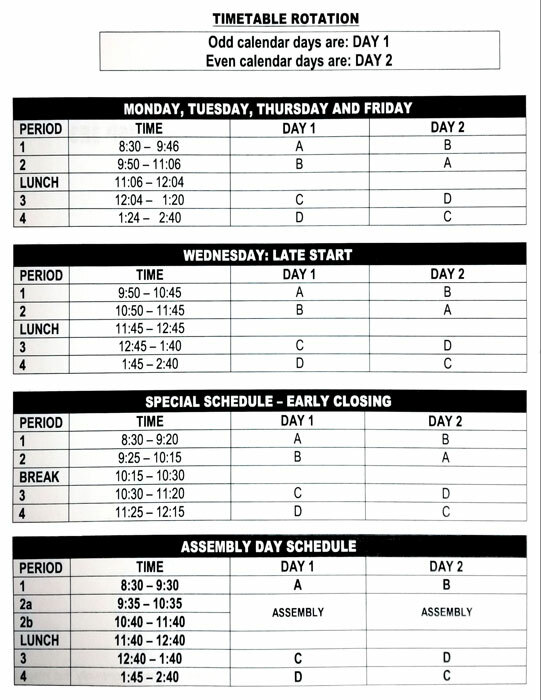 Below is a sample table put out, showing student samples. Some of the projects shown above from left to right are: bridge building, CO2 Dragsters, aluminum machined chess piece sets, 3D plastic printed student projects, electric track race car, electronic motorized cockroach, CNC coat rack sign, and custom T-shirts. There is also a whole bunch of 3D parametric designs and graphic communication related projects. "Hot off the press", our new clam heat press is used to transfer designs on to T-shirts. 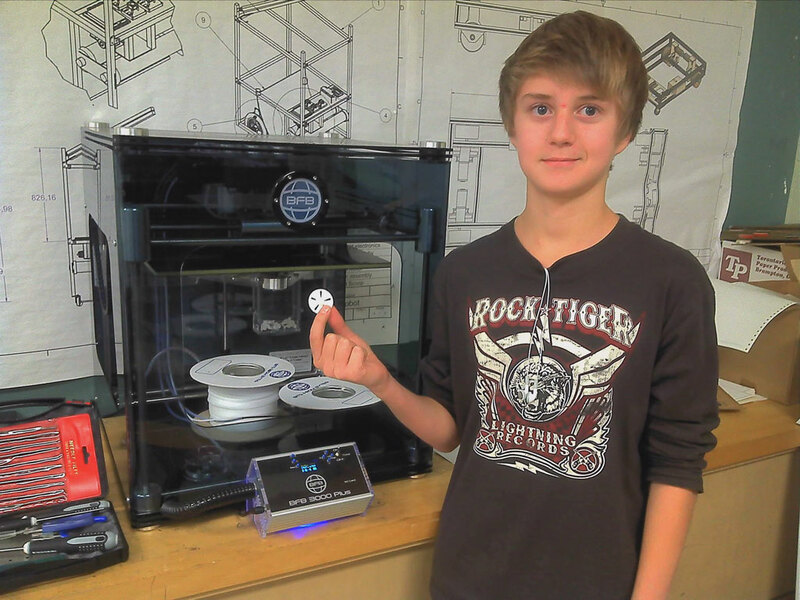 The process is very easy here in Design Technology. Everything from black and white illustrations to full sized colour images can be transferred on to T-shirts easily. 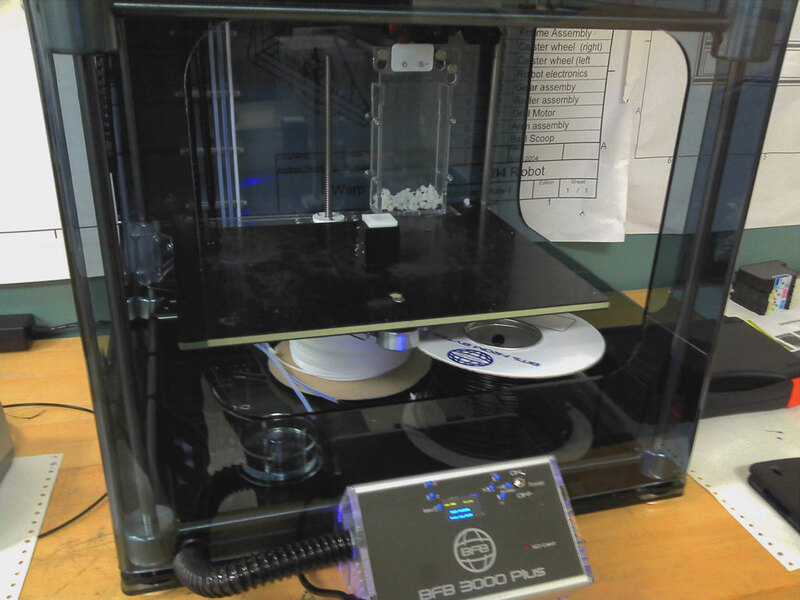 The Design Technology - Robotics now have a brand new 3D Printer which prints objects using plastic filaments (rolls of filament seen below table bed) in 3D of course! 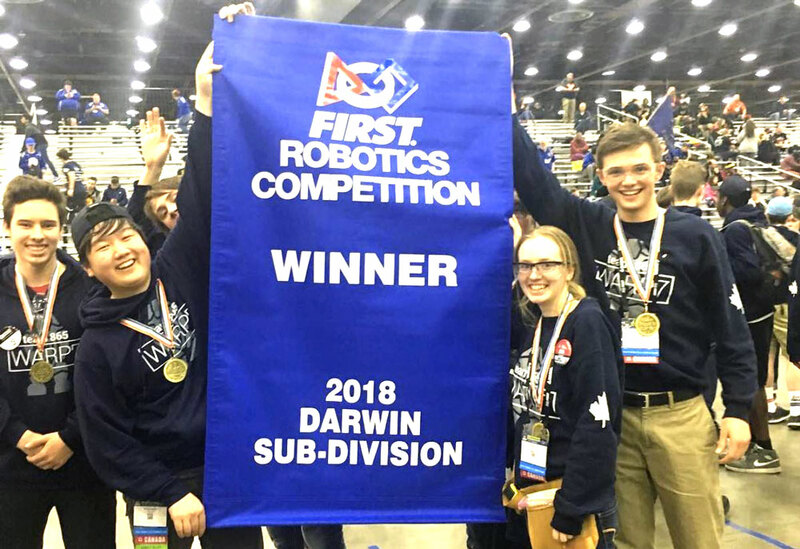 Our robotics team, WARP7, has climbed the highest they have every been, wining with the Darwin Alliance FIRST championship in Detroit, ranking 7th out of the 67 teams in the Darwin division. 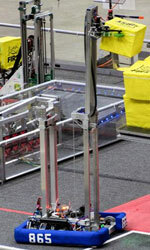 Wining their last game contributed to the win in their alliance division, later finishing 6th out of over 3,500 teams in the world. 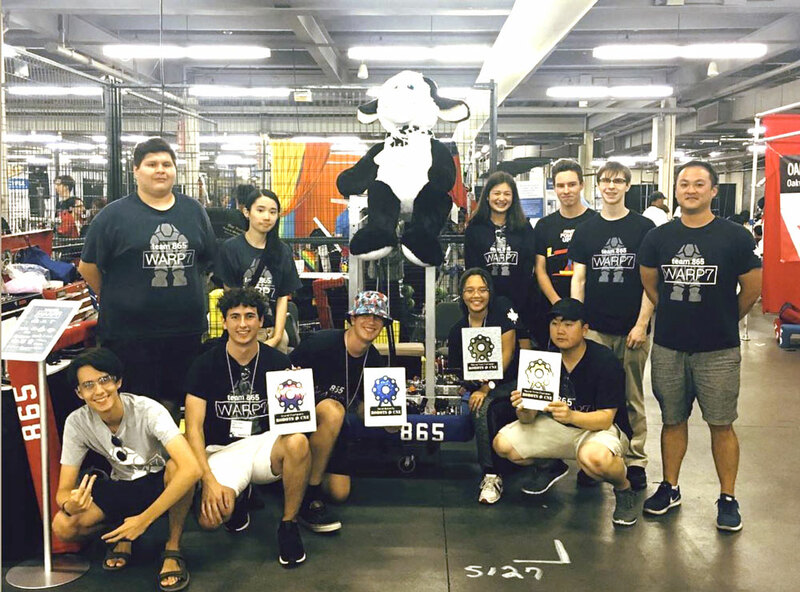 WARP7 won lots of awards including Innovation for their 2018 robot's control system that helped with automating their grab and lift mechanism, allowing for ease and speeding up their operation. 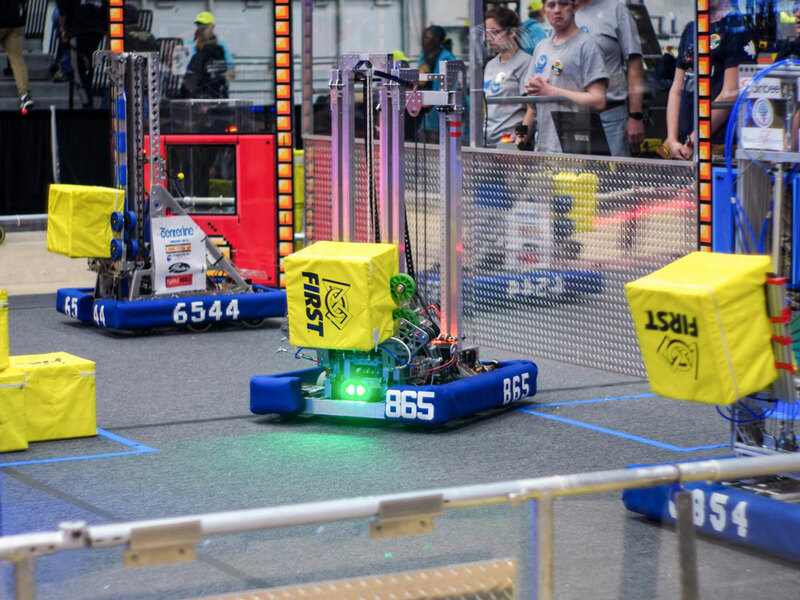 Details on all of their events for 2018 can be found here on the FIRST Robotics Competition Events page, and more info on Western's Site. Students get an extended lunch to enjoy a time of fun, games, and food. The day was beautiful and there was lots of cooking on the barbecue. I helped out with the cooking, but students and Mr. Schneider did most of the work for the BBQ We had music, different fun games of challenge and even a cotton candy machine to enjoy sweets. Eight new picnic tables built by our Construction class, tug of war, pie in the face, funny picture takes, ball toss, and so much more. All in all a very successful day, and students had lots of fun. 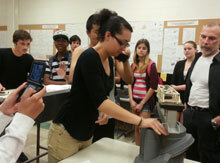 Invited to George Brown College, our students were part of a presentation tour for local grade 7 and 8's. Six of Western Tech's robotic team, WARP7, presented to junior students about their experiences with robotics, what it is all about, and followed through with an exciting live demo with our full size Mechanum bot and mini bot. Excited junior students had the thrill to drive the mini bot around for a few minutes at the end of the presentation. Click the image below to see more pictures in the Gallery. Myself and two teachers went to Woburn Collegiate to observer their F1 in Schools CO2 car racing competition. I started a a similar program several years back when I founded the Integrated Technologies program, but later the program changed into our current Exploring Technologies with a three rotation format (a little history). 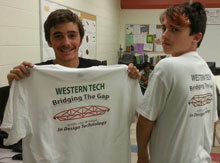 It was mostly Woburn students competing and one other school SATEC W. A. Porter Collegiate Institute. 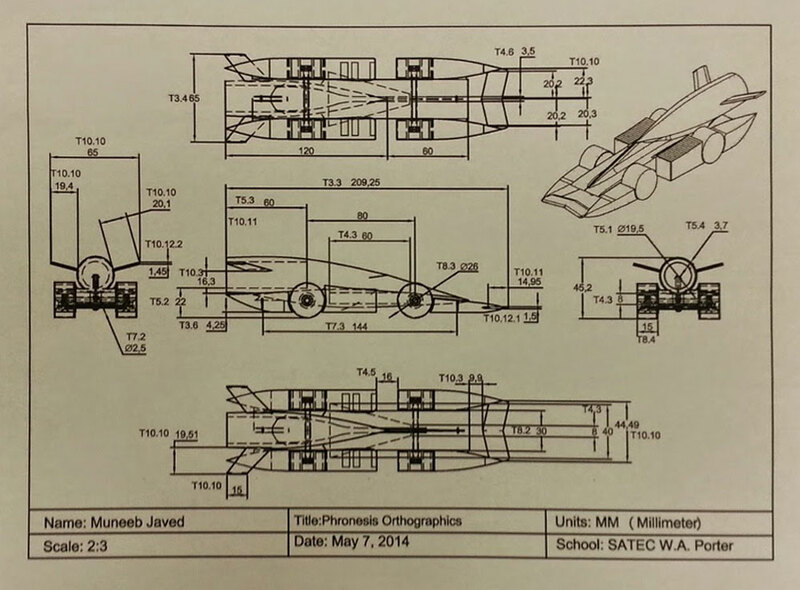 Like Porter's student team Phronesis, teams came up with an interesting F1 cars using a number of different processes , poster displays, sponsor packages , brochures , web sites, and designed in CAD. Click on the pictures below to go to each of the picture albums in the gallery, to see more. 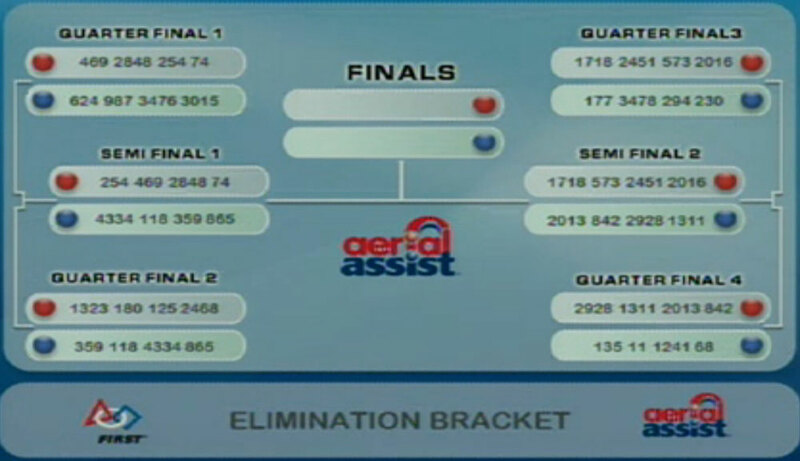 FIRST Robotics Competition - AERIAL ASSIST Championship! 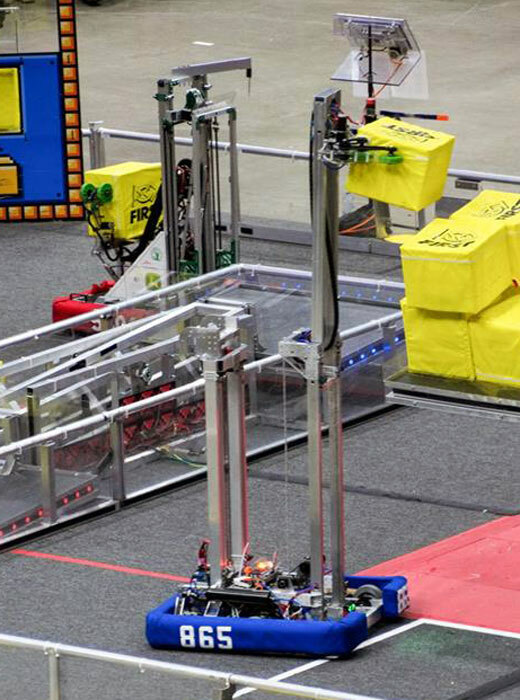 Our team wins at the Waterloo Regional and went to the international championship in Missouri in St. Louis, MO, April 23-26, 2014. 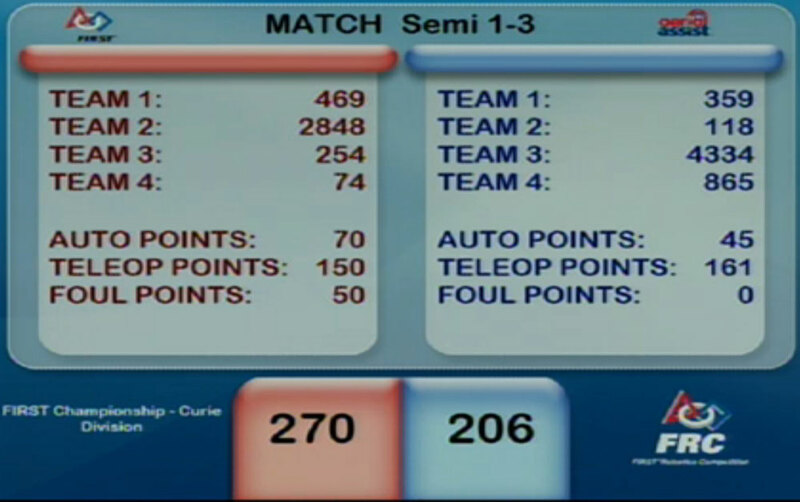 Our robotic team, WARP7 - team 865, has an interesting robot position /function this year with a start pass-through strategy and is talked about in Chief Delphi forums as a favorite in our Curie division, Just do a search for 865 in the above link to read about wining predictions. 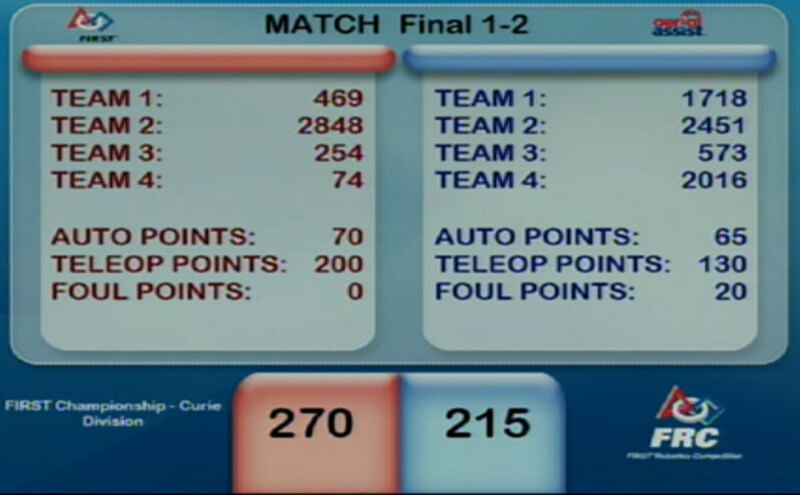 Below are some picture score recaps of Curie Division. 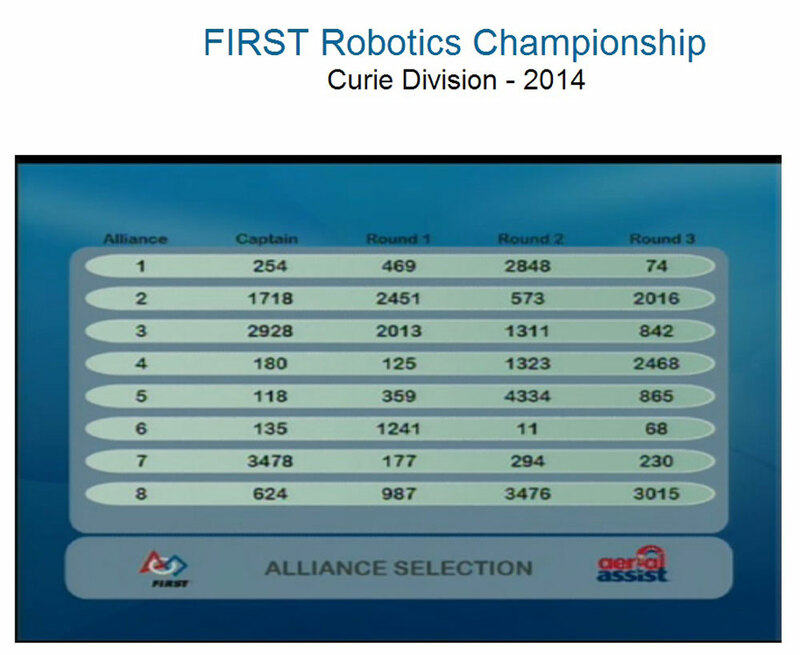 As we were in Curie division we congratulate teams 469, 254, & 2848, also in Curie division on wining the the 2014 FRC First Robotics Aerial Assist Championship, and to team 27 for wining the Chairmans award!